Welcome back to Operation LinkedIn! Glad to have you back. Next up we will be talking about your LinkedIn summary. Think of your summary as a snapshot of your entire business, or rather, what you want your customers to know about you in 30 seconds or less. It is your chance to create that perfect first impression. Here are a couple of suggestions to create the perfect summary. Make sure that you are giving off the appropriate tone. It’s important to avoid sounding robotic, and to refrain from using complicated wording. Instead, focus on keeping your summary casual and friendly, as if you were telling someone about your business while drinking coffee together. It’s important to keep this casual tone to avoid sounding entirely self-focused. Instead, you want customers to feel as if your business is a person that they can connect with for more than just sales opportunities. It’s no secret that with the overload of advertising we see today, attention spans are short. Keep this in mind when writing your summary. Avoid making your summary a chore to read. Bogging readers down with paragraph after paragraph of information overload is a big no. Keep it short, simple, and sweet. Keywords are a way for your company to show up on LinkedIn when people are using the LinkedIn search bar. Therefore, sneak important keywords relevant to your business into your summary. For example, instead of stating in your summary that you are a “marketing company”, write that you are a “ An OOTS Innovative marketing company that specializes in website services and search engine marketing”. If you want to know which keywords are common, look at this article about “buzzwords” for 2016. Remember, your summary is all about strategy, quality over quantity is the main theme here. 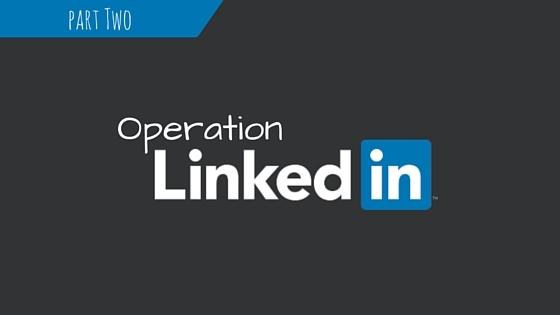 Thanks for stopping by today for another post of “Operation LinkedIn”. As always make sure to subscribe, and check in tomorrow where we’ll be discussing mistakes to avoid when using linkedIn.